VIDEO: Rep. Giffords Leads Crowd In 'Pledge' At Tucson Memorial : The Two-Way One year to the day after a gunman opened fire during a Tucson meet-and-greet with her constituents — killing six people and wounding 13 — the still-recovering Rep. Gabrielle Giffords (D-Ariz.) spoke for the first time since then at a public event. One year to the day after a gunman opened fire during a Tucson meet-and-greet with her constituents — killing six people and wounding 13 — the still-recovering Rep. Gabrielle Giffords (D-Ariz.) on Sunday spoke for the first time since then at a public event. Rep. Gabrielle Giffords (D-Ariz.) and her husband, Mark Kelly, as they recited the Pledge of Allegiance at Sunday's memorial service in Tucson. "Her words were clear, deliberate" and drew cheers from the crowd of about 3,500 at the University of Arizona, the Arizona Republic reports, as the congresswoman led them in the Pledge of Allegiance. 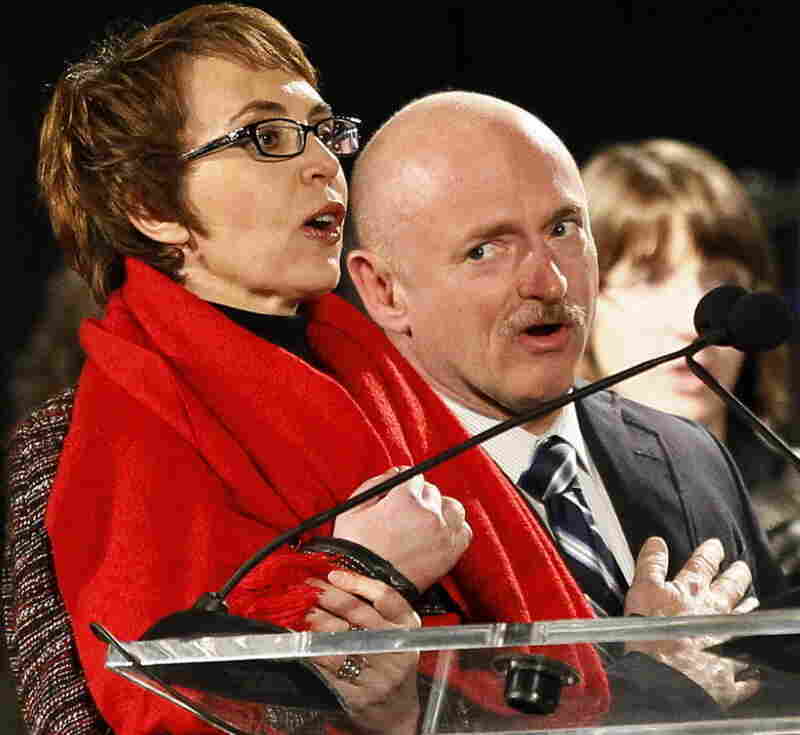 Her husband, retired astronaut Mark Kelly, helped Giffords put her injured right arm across her chest. In case you haven't yet seen that emotional moment, The Associated Press has the video here. NPR's Ted Robbins reported from Tucson for Morning Edition.